This square-bound book includes a reprinting of a two-part Heroes Incorporated story from 1995 and eight pages of bonus material from the never-completed third part. It is published in the Hurm Studio section of Lulu.com. 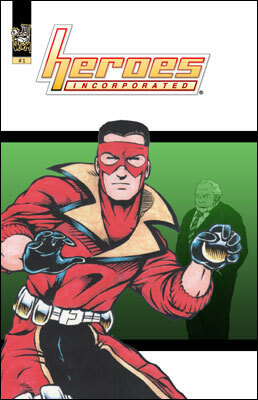 Heroes Incorporated was written, penciled, and inked by Keith Quinn (who also colored the cover and typeset those sections that have text!). This story was originally completed in December of 1994 and published in two parts under the Hurm Studio imprint by Double Edge Publishing in March of 1995.